Leawo iTransfer is a comprehensive program that help you to transfer many kinds of files among iOS devices, iTunes and PCs. It could perform as iPad to iPod transfer to transfer music from iPad to iPod within simple clicks. 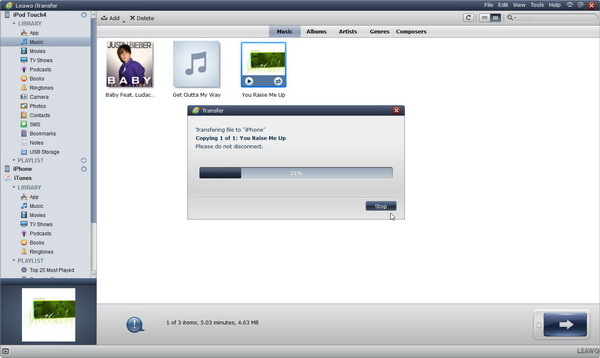 The below guide will show you how to transfer music from iPad to iPod with this iPad to iPod music transfer software. Download and install this icopy on your computer. 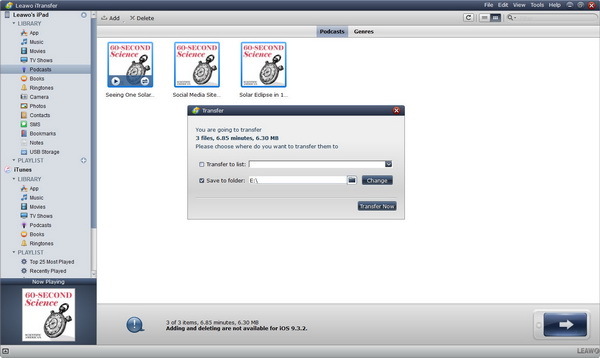 Before you begin, you should download and install Leawo iTransfer on your computer. Then follow these steps to transfer music from your iPad to iPod. After your devices are connected to the computer, this iPad to iPod transfer will detect the two devices and display the libraries of them. Click the name of the iPad and choose music in the sidebar. Then the music in your iPad will be showed on the right window. 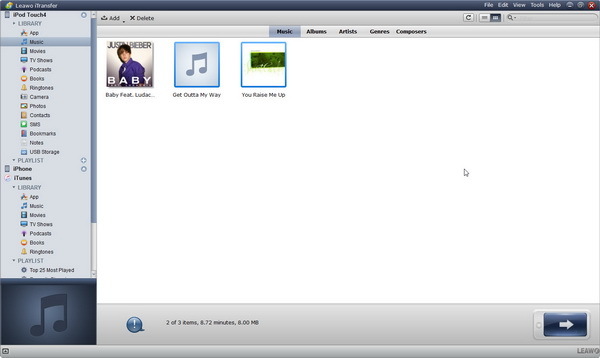 Check the right window to select music that you want to transfer and click the transfer button. 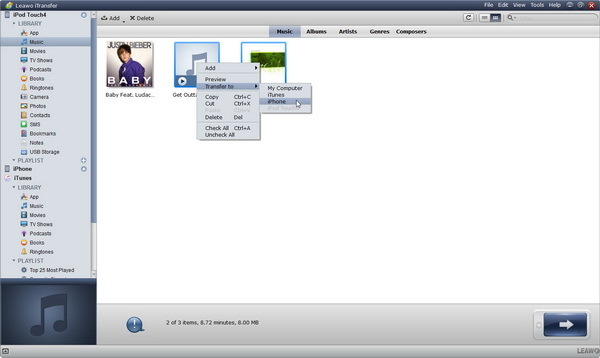 Or hold Ctrl/Shift key to select certain files, and right-click the selected music and choose "Transfer to > iPod". Then you will be guided to set an output directory to save the transferred podcasts. You could determine the directory in the "Save to Folder" option as you like. Click the transfer button, a dialog box will open, check Transfer to List in the dialog and choose iPod as a target. Then click Transfer Now. Here you go, the transferring begins. With Leawo iTransfer, you could copy multiple data and files like music, video, photos, etc. between iOS devices, iTunes and computer. If you’re using a Mac computer, you could make use of Leawo iTransfer for Mac. 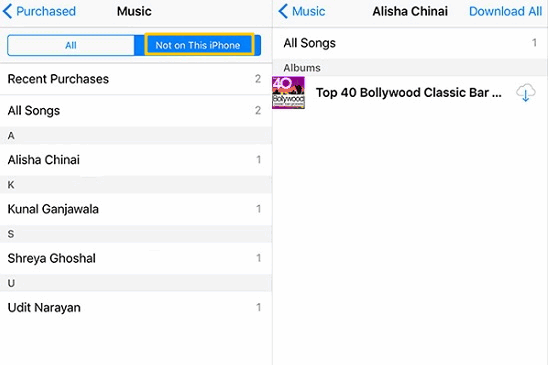 There is another way of iPad to iPod music transfer that adopted by most people – iTunes. But it only works for the songs you purchased from the iTunes store. Launch iTunes, go to the Store and choose "Authorize This Computer". Enter your own Apple ID to purchase the songs. Connect your iPad to the computer, and Click "Files>Devices>Transfer purchases from iPad". And the iPad music will be added to your iTunes library. Unplug your iPad and connect the iPod to computer. 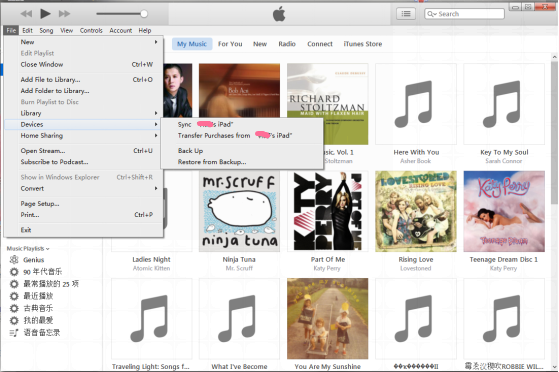 Select "Music>Sync Music" in iTunes library to your iPod. Now, you have successfully transferred purchased music files from iPad to iPod. You could now freely enjoy music purchased on iPad with your iPod at your will. You can also directly download songs with the same Apple ID that you used when purchasing the music. On your iPod, sign in with the same Apple ID as that of your iPad. Open the iTunes Store. Tap "More>Purchased>Music". Choose "Not on This iPod". Select the song, album, or music video that you want to download and click to get the music on your iPod. Above are three methods provided to help you figure out the iPad to iPod music transfer. Definitely, some of you will ask what the differences are. As for the solution2 and solution3, you can only transfer the purchased music to your iPod. It just a little annoying that you have to pay so much money to enjoy your music, especially for students. Moreover, solution3 requires longer time since you have download the music on iPod and it can only apply to new iPod model. While for the solution1, you can transfer all the music to your iPod whether you purchased it or not. So which way will you choose to transfer music from iPad to iPod? For me, undoubtedly, the Leawo iTransfer.